Self-Managed Super Fund – Can You Manage It Yourself? Can I manage my own SMSF? Recently, a self-managed super fund (SMSF) has become almost a fashion accessory and sometimes a status symbol among friends and colleagues. There’s no doubt SMSF provides ‘mum and dad’ investors flexibility and control over their super fund. 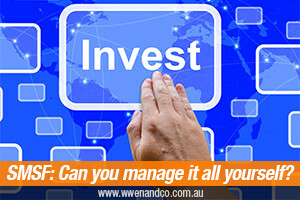 BUT, is managing your own SMSF the best strategy for non-professional investors? Do non-professional investors have the skills and knowledge to manage their SMSFs effectively? Often ‘mum and dad’ investors obtain advice from their accountants in the establishment stage of their SMSFs and compliances matters. However, their approaches to investments are varied case by case. So, should I manage my own SMSF? We have been seeing a large number of SMSFs with the majority (if not all) their funds held in cash accounts for many years. In this instance, inaction or no investing, apparently allows inflation to slowly eat up your super fund over the years. In contrast, some SMSFs have invested heavily in risky assets or non-conventional financial products. Some SMSFs lost heavily during the Global Financial Crisis, which was not all that long ago. Obviously, unless you have substantial skills and in-depth knowledge in finance, you can’t successfully manage your SMSF investments yourself, especially in the current volatile financial market. While SMSFs provide you with flexibility in what and how to invest your money, you want to be aware that there are sharks (risks) in the financial market. A qualified financial planner can provide professional advice to manage your investments in a systematic and disciplined manner. In general, a good investment strategy will be customised to your financial goals and your risk tolerance. Diversification is the golden rule of investments. Professional and independent financial advice definitely will help you avoid the mistakes you may make when you are untrained, unskilled and alone. Call Kevin Wu, specialist financial planner, at our Epping Office on (02) 9871 3429 to see how we can help you to achieve your financial goals.